Government Office announced the conclusion of Deputy Prime Minister Vu Duc Dam at the meeting on resolving the difficulties and problems related to the granting of Vietnam visa for foreign tourists visiting Vietnam. 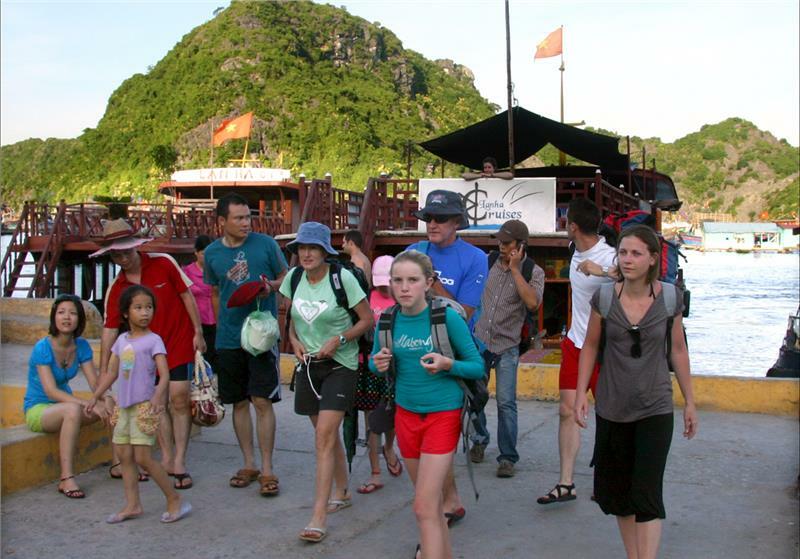 Accordingly, international visitors exempted visa to Vietnam will be extended for 15 days, visitors who exit to the third countries and then return to Vietnam will be granted a visa at the border gates. Vietnamese Deputy Prime Minister asked the Ministry of Public Security in collaboration with Ministry of Culture, Sports and Tourism and related agencies to consider and resolve Vietnam visa extension for visitors who come from countries enjoying the unilateral visa exemption policy by Vietnamese Government want to continue staying in Vietnam for traveling purpose, if they are guaranteed and managed by an international travel company, following the tourism programs organized by enterprises and have return airfare. The temporary residence term fits tourist programs but not more than 15 days and only 1 time for extension of temporary residence. Besides, consider and grand Vietnam visa at the border for visitors from countries enjoying unilateral visa-free entry Vietnam exit to a third country and then return to Vietnam from the moment exiting Vietnam less than 30 days, if visitors have flights leaving Vietnam. Visa has to fit the duration flight but not exceeding 15 days. Some enterprises said that new decision has resolved difficulties in term of procedure and time for visitors to get visa to Vietnam. Enterprises expected to have regulations reducing the visa cost for visitors coming form these markets. Hoang Thi Phong Thu, Chairman of Anh Duong Travel Company specializing in Russian visitors who are exempted Vietnam visa on arrival for 15 days said that with the new decision when the visa exemption expires, visitors only need to apply for extension of temporary residence permit instead of a visa if they want to stay longer. Deputy Prime Minister asked Ministry of Culture, Sports and Tourism to strengthen the inspection and examination of international travel enterprises in the performance of underwriting and management of visitors who ask for the temporary residence extension, to have strict sanctions for violating enterprises in accordance with law. Moreover, researching, building and summiting the Fund Support Tourism development Scheme for Prime Minister's approval, including clearly defining the model, operating principles, resource mobilization, financial management mechanism of Fund. Ministry of Culture, Sports and Tourism in collaboration with Ministries: Foreign Affairs, Public Security study, propose to expand the visa-free countries, primarily countries with potential tourist source, the strategic partnership with Vietnam. Then ministries summit for Government to consider and decide in June 2015.